Postcards, slides, and books are of the subject matter of Claudia Angelmaier's photographic series. In her second solo exhibition in Berlin at Galerie Alexandra Saheb she explores the possibilities of layering, displacement, and double exposure in a number of variations. In the series Rückenfiguren (Backs) the front and back sides of common art postcards are perfectly superimposed and then enlarged to the size of the original. 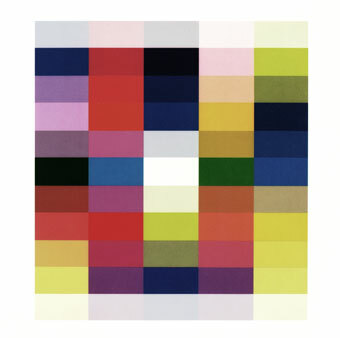 The abstract, small-format works 25 Farben I-IV (25 Colors I-IV) are based on a reproduction of Gerhard Richter's 25 Farben. His 25 monochrome color squares form a grid of randomly placed colors. Angelmaier carries over this principle of chance into her approach in the arrangement and selection of the color schemes. Through double exposure and depending on the degree of displacement of the layered images the original color squares are doubled and even quadrupled. The artist thus transforms the original image and its context into a new work with different blends and patterns of color. In her work Claudia Angelmaier repeatedly raises the question as to the reproducibility of the image. Whereas earlier work focused on questioning our art viewing habits and the reproducibility of art, in her most recent works she now turns to the medium of reproduction and its susceptibility to change. For the series works on glass she photographed glass slides, worn with age, of historical paintings. The almost monochrome appearance of the images on the slides is coated with a veritable second skin of oxidation. Angelmaier offer a fresh perspective on fundamental question of the relationship between painting and photography.